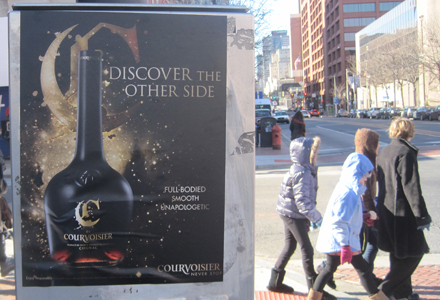 To raise awareness for C by Courvoisier, a new offering by the cognac brand that will hit retail shelves this month, Courvoisier in January launched a guerrilla marketing campaign that includes three components—wild postings, stenciling and mobile projections. 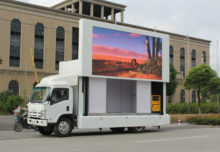 The effort will roll out in nine markets and continue through mid-March. C by Courvoisier is produced in small batches from the grapes of 50 winegrowers in the Fin Bois Cru region of France and offers an intense, bold flavor. 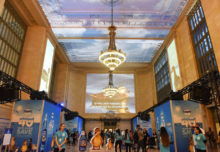 Mobile projections broadcasted images onto the sides of buildings in Indianapolis during Super Bowl weekend and will re-appear in Orlando later in the month for the NBA All-Star game. Wild postings of the brand’s creative were placed in 100 high-traffic locations in nine cities—Atlanta, Chicago, Detroit, Indianapolis, Los Angeles, New York City, Orlando, Philadelphia and Washington, D.C. Stencils were applied to sidewalks in 20 to 70 locations in Atlanta, Los Angeles and New York City. Agencies: Moderne Communications, New York City; Walton Isaacson, Chicago.